The post- WWII drama “The Aftermath” isn't just a shallow depiction of a complex place and time, it's a dangerous one. Just how we should treat people who believe in dangerous ideologies, especially their fanatical young followers, is dangerously relevant in our current state. But “The Aftermath” would rather give us clear, easily identifiable villains along with a hot, steamy affair between star-crossed lovers than actually try and delve into the issues it itself raises. Fresh off the train and a stiff meeting with her husband, Lewis (Jason Clarke), a colonel in the British Army, we find Rachel shares much of those sentiments. 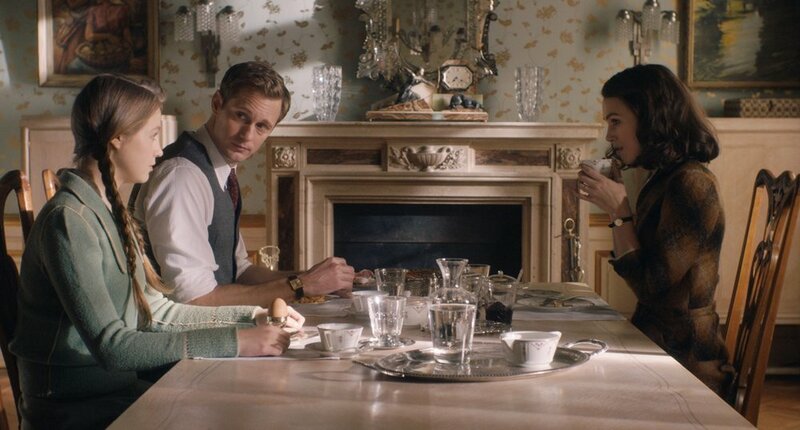 That makes it especially awkward when her husband announces that they'll be sharing the grand home the Army has requisitioned with its previous German owners, the widower Stephen Lubert (Alexander Skarsgård) and his troubled daughter Freda (Flora Thiemann). You'd think after one look at Stephen, Lewis would know better. Then again, anytime he and his wife are together, any warmth between them is mostly on her side. The fact that their estrangement is due to the death of their son in a London bombing is understandable, and even sympathetic, but Lewis's seeming inability to meet any of his wife's needs makes it difficult when “The Aftermath” finally does try to make a case for why they should be together. As for Stephen, he's soon revealed to not just be one of the good Germans, but a perfect one in a movie where any and all sympathies are firmly with them. Not only was never a member of the Nazi Party, he was firmly opposed to everything they stood for. Even his gorgeous home, which stands out as a kind of oasis amidst the squalor, is something that came from his wife and the business interests of her father. He never had to sully himself acquiring such luxurious comforts at the expense of anyone else. Hell, the film even outright states that he was never in uniform, and thus has no blood on his hands. Except for one scene where pictures from the camps are shown, you'd hardly know there was a Holocaust at all. It's truly galling the way “The Aftermath” depict Germans as pitiful underdogs, with their protests against the British occupation coming off as especially offensive, not only considering those who opposed the Nazi regime could hardly do the same, but how it tries to visually equate these people with today's protesters, who are far more villainized for far less legitimate reasons. There is not a single Holocaust survivor on-screen, let alone any mention of how many were ostracized and politely but firmly told to leave the past in the past. I haven't read the source material, but reviews, and even the summary on Google Books, leaves one with the impression that it was done a great injustice. Lovers of period drama will find something to enjoy in the chemistry and performances by Alexander Skarsgård (in spite of his hilariously uneven German accent) and especially Keira Knightley, who also deserves far better. Many movies have not only done what “The Aftermath” is trying to do, but done it with a courage and conviction this one obviously lacks. Even “The Book Thief,” which also failed to fully do justice to its source material, does a better job earning sympathy for Germans in this time period. True, Geoffrey Rush isn't nearly as photogenic as Skarsgård, but you can't have everything.